The Trans-Canada Highway is celebrating its 50th birthday in 2012 and the centennial anniversary of the first coast-to-coast road trip made in the country — accomplished by Thomas Wilby and Jack Haney, travelling from Halifax to Victoria. Vacay.ca writers have hit the road to come up with great tales to tell along this vital and historic route. Previously, Katie Marti suggested tips on how best to see the British Columbia, Alberta, Saskatchewan, Manitoba, Ontario, Quebec and New Brunswick legs of the route. In the eighth installment, Adrian Brijbassi lets you in on places to stop in Canada’s smallest province. VICTORIA-BY-THE-SEA, PRINCE EDWARD ISLAND — The first stop you should make when you cross over the 13-kilometre Confederation Bridge and enter Prince Edward Island is here, in idyllic Victoria-by-the-Sea. It’s a cozy seaside village with boutique retailers, tea and chocolate shops, a community theatre, and splendid views of the Northumberland Strait. Less than two kilometres off the Trans-Canada Highway, Victoria-by-the-Sea epitomizes why Prince Edward Island is such an appealing destination for tourists on a road trip. It’s easy to navigate, provides both small-town charm and, as its name suggests, a touch of old-world elegance. While there are B&Bs and a tony inn, road trippers will likely spend no more than an hour or two, and leave promising themselves they’ll be back for more. And you’re likely to say the same about many other spots in this tiny province that covers 5,660 square kilometres (2,184 square miles). PEI is called the Gentle Island and it’s a monicker that truly suits it. Driving along the Trans-Canada Highway or any of the routes that spring off of it is mostly an easy, languid journey through farm country and fishing towns with red-sand beaches and outstanding golf courses nearby. The Trans-Canada doesn’t cover the entire island. It runs southeast 115 kilometres (71 miles) from the Confederation Bridge, which links PEI with New Brunswick, to the Wood Islands Ferry Terminal that shuttles passengers and vehicles across the Northumberland Strait to Nova Scotia. You’ll no doubt stop in Charlottetown, the provincial capital and one of the most fun and underrated cities in Canada. Cow’s ice cream, heralded in one survey as the best in the country, will entice a visit, and so should the Gahan House & Brewery, among the top brewpubs in Canada. But you don’t have to stick to the southern coast. It only takes about 30 minutes to drive from the south end of PEI to the north, where picturesque spots like North Rustico and Prince Edward National Park can be found. 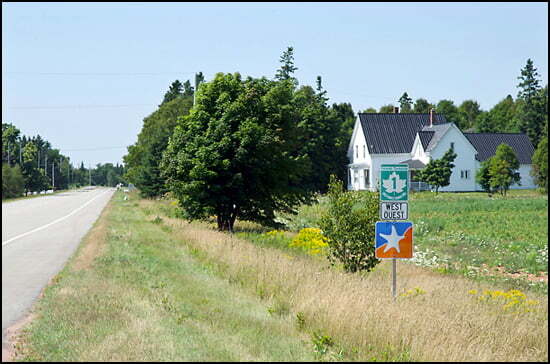 And, of course, the island’s biggest draw, Cavendish, is less than 40 kilometres (25 miles) from Charlottetown. There, you’ll find Anne of Green Gables and the tremendously popular fictional village of Avonlea. The fabricated hometown of Anne Shirley is set in 1908, when the British flag still flew in Canadian communities and horse and buggy and bicycle were the preferred mode of transportation. You’ll arrive by car and likely marvel about how Anne’s world surrounding Avonlea has changed so much, thanks in large part to the nation’s cross-country route that was completed a half-century ago.